For veterans who struggle with post-traumatic stress disorder, the pops and bangs of July 4th fireworks can bring them right back to the battlefield. When retired Army 1st Sgt. Warren McDowell first returned from a tour in Vietnam in 1965, he struggled to adjust. But it wasn’t just day-to-day civilian life that overwhelmed him. For veterans like McDowell coping with post-traumatic stress disorder, the pops and bangs of July Fourth fireworks can take them right back to the battlefield. McDowell, 74, of Blue Point, hopes this year will be less stressful. 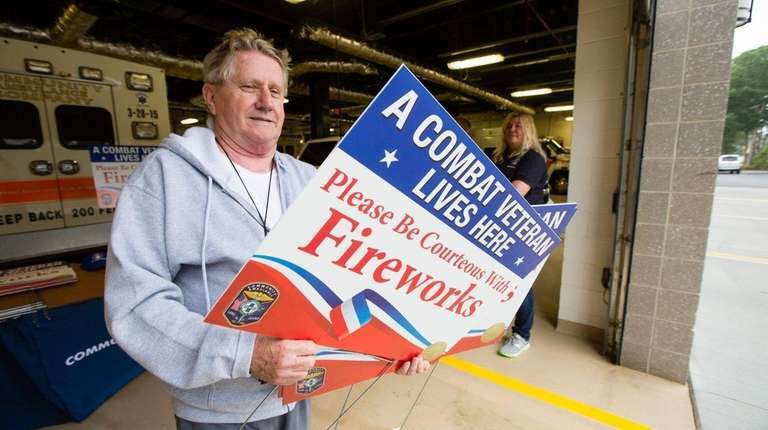 On Saturday, he picked up two yard signs from Sayville’s Community Ambulance Company that read “A Combat Veteran Lives Here, Please Be Courteous With Fireworks” — one for him, another for his brother, also a Vietnam veteran. From 9 a.m. to noon, the company handed out about 50 signs to veterans and their families on Saturday in Sayville, said Jamie Atkinson, director of the ambulance company, which provides service to Bayport, Bohemia, Oakdale, Sayville and West Sayville. The signs were paid for by the company and offered free to veterans. “It’s one of those issues where, if you don’t know someone or haven’t experienced it yourself, you wouldn’t be conscious of it,” said County Legis. William Lindsay, who represents the 8th District of Suffolk County including Sayville, and helped publicize the event. This is the first year the company has offered signs, Atkinson said, but similar signs have been growing in popularity over the last several years. The Indiana-based group Military with PTSD has distributed thousands of signs for veterans across the country to display in their neighborhoods since 2014. Consumer fireworks are illegal in New York State, and some areas like New York City and Nassau County have separately banned sparklers. But despite attempts from county and state officials to discourage their use, explosive fireworks still make their way into neighborhoods. 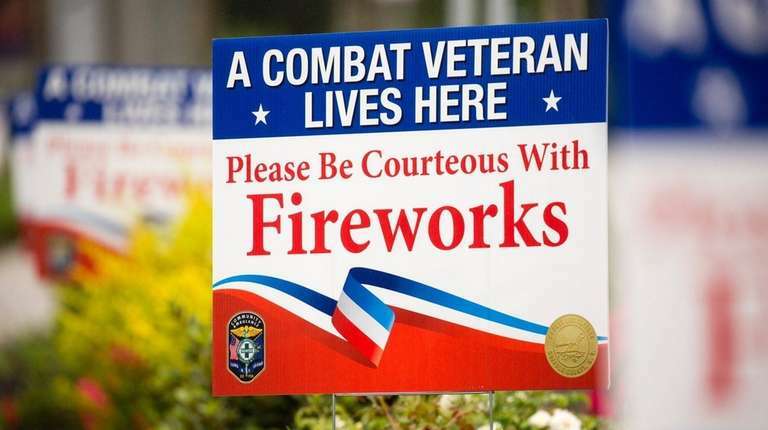 Atkinson said the signs are intended to help start a conversation between veterans and their neighbors about their needs as July Fourth approaches. Not every veteran has an issue with fireworks and those who do vary in their ability to handle the whistles, booms and bangs from professional shows to unexpected pops from a neighbor’s yard. McDowell said he believes the signs can help other veterans, especially those who haven’t had as much time as he has to adjust back to civilian life. “I absolutely would have appreciated a sign like this,” he said.